Our goal over the next week is to run down all the foods in the fridge, freezer, and pantry. This means very little new purchases and living mostly off of the haul received from our farm share. I'm very bad at not purchasing new foods when I see them so this will be a test of will power. I already know I will falter tomorrow because I'm planning on picking up some pork belly at the market. With the temperature in the low 70's tomorrow it may be my last opportunity to run the oven without regret until we hit the fall. I'm not very good at meeting goals. 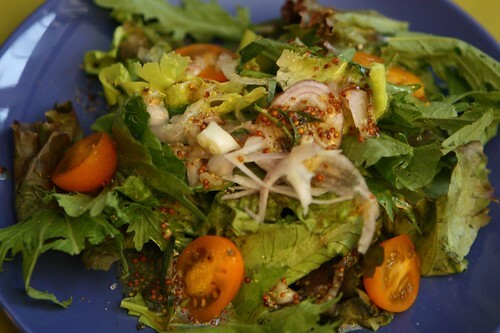 I started off by making this salad with red sail, buttercrunch, and mizuna lettuce. For a dresing I combined some shallot, Lyle's Golden Syrup, Maille mustard, lemon, and fresh tarragon. I've never been a huge fan of tarragon. I've always found it somewhat offensive. Jen shares this feeling because, like me, she once used too much tarragon in a recipe and suffered from what I like to call "tarragon fatigue." In 1997 I made a tarragon sauce from the tarragon in my mother's herb garden and I remember my first encounter with this experience. Only recently have I figured out how to really use the herb without regret. Today I saw someone making Poulet Veronique and I figured, since we're on the theme of tarragon, I would make this for dinner. It used up a lot of the things I happened to have lying around: butter, grapes, chicken breast, tarragon, cream, a shabby white wine. Why not throw this all together? I probably haven't made this dish since 1997, the same year I turned myself off tarragon. I must say that tonight's return to tarragon was a success. 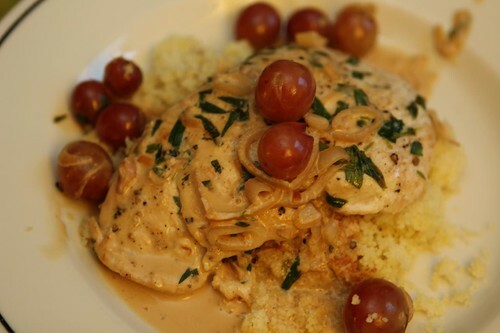 I seasoned the pounded chicken cutlets with salt, pepper, and tarragon, browned them in a pan with butter, then removed them, added the shallots, grapes, white wine, and cream to reduce. I served the chicken and sauce over some couscous. This is probably not the most traditional preparation but if you are a reader of the blog you know that I have a general disdain for the rigid rules of classical French cooking. I'll remind my readers that I also put a sweetener (Lyle's Golden Syrup) in my vinaigrette, a major French culinary no no. Somewhere my classical French instructors from culinary school are turning in their graves, even the ones that are still alive. 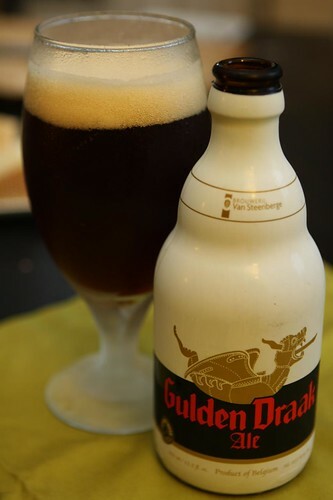 For beer I had the final of the six beers from Brouwerij Van Steenberge that my parents got me, the Gulden Drak. It just so happens that this may have been my favorite of the bunch. At 10.5% alcohol one beer was probably more than I really required this evening. Belgian beer was the closest to French that I could find after rummaging in our fridge. Every so often I like to make a French meal. I like to remind myself that my general distrust of it from years of overexposure overshadows how good it can actually be. This meal ended up being very nice on a late night after bidding Jen's sisters adieu. Tomorrow I plan on taking full advantage of not having to cook vegan or vegetarian. You can assume that mean some fatty pork will be coming your way soon. Pork fat rules! Labels: beer, French, How'd we use it?